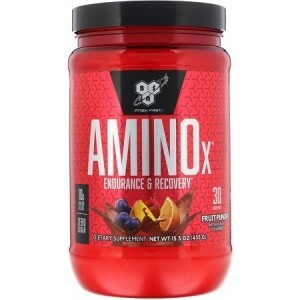 BSN Amino X BCAA - Branched-chain amino acids are three specific amino acids - leucine, isoleucine and valine - that are part of the nine essential amino acids. 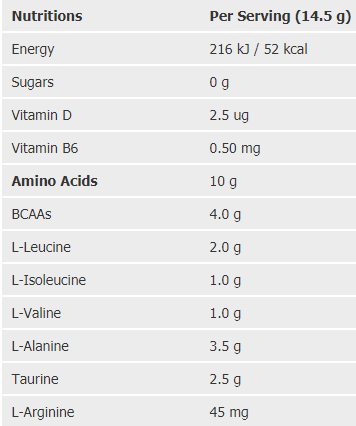 An interesting aspect of BCAAs is that they are metabolized in the muscle tissue, not the liver. For this reason, BCAAs lend themselves readily to help support muscle recovery as well as offsetting muscle breakdown. Most notably, leucine has many novel anabolic properties. Along with stimulating muscle protein synthesis, leucine may also activate the mammalian target of rapamycin (mTOR), which is responsible for regulating cell growth. In addition to delivering the all-important BCAAs, AMINO X also contains the essential amino acids L-Taurine, L-Citrulline and L-Alanine. The amino acid citrulline is known for its promotion of nitric oxide production, while taurine promotes the uptake of nutrients into the muscle cells and alanine is known to convert to pyruvate in the body which may help aid in the production of glucose during intense training. As a dietary supplement, mix 1 scoop with 180 ml of cold water or any beverage of your choice before, during, or after your workout.